When you apply for a job you are typically asked to complete an employment application. You may be asked to complete a job application even if you have already submitted a resume and cover letter. That way, the employer has a record of your personal and employment history, verified and signed by you. It's important for your job applications to be complete, void of errors, and accurate. You'll need your resume (or a list of your employment and education history) to make sure that you're listing the correct dates of employment, job titles, and education. Your resume should match the job application perfectly because discrepancies will be noticed. Download a job application sample and practice filling it out. That way you can be sure that you have all the necessary information, in advance. If you're applying for a position in-person, ask for a job application, then take it home with you to complete. You can take your time filling it out so it will be neat and tidy, as well as accurate when you return to drop it off. When you stop by, to pick up or drop off a job application, be sure you're dressed appropriately. You may end up speaking to the hiring manager and it's important to look professional, just in case you get an on-the-spot interview. If you review an in-person job application list beforehand, you'll ensure not making any blatant errors during the interview process. Job applications for many companies are often available online. For example, a Walmart Employment Application can be completed online and the same holds true for many other large national employers. 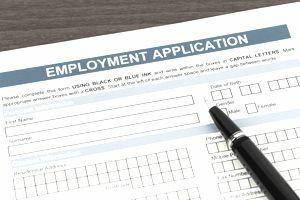 In fact, some employers no longer accept paper applications and applicants are required to apply on the company website or the site where the company listed the job openings. Explicitly follow the instructions when completing both online and paper job applications. The slightest error could knock your application out of the running before an employer even gets a chance to look at your application. You might also want to check the company website, or the fine print on the job application form, to verify you've followed the directions as instructed. Thoroughly read the instructions for applying for employment before you click the submit button (or hand in your application). Make sure every field is filled in. Some companies refuse to accept an incomplete application. Some companies test applicants for employment in order to determine if the candidate is a good match for the job. Companies who conduct pre-employment tests (such as talent assessments) are seeking applicants that match their very specific hiring criteria. Being prepared for employment tests will help you respond better to employment-related questions. Some companies require drug tests for applicants seeking employment. The list below includes all the information you need to complete an application for employment. Remember, the more prepared you are, the better your chances of getting hired. It pays to review sample job applications to give you an idea of what will be asked of you. It also pays to print out one or two applications and complete them, so you know you have all the information needed to complete actual employment applications. If you need to mail a job application or follow-up on an application you've submitted, take the time to review some sample job application letters for examples of what to write and how to follow-up.